“The earth and everything in it, the world and its inhabitants, belong to the Lord; for He laid its foundation on the seas and established it on the rivers.” Psalm 24:1-2 Holman Christian Standard Version. I am always awe-struck with the overwhelming beauty of Niagara Falls, whenever I am there. 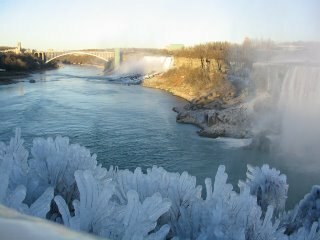 I took this picture in the winter of ’03 from the Canadian side looking down the river. What awesome majesty is displayed in just the grandeur of the creation! How awesome He is to allow us to see just a portion of His wonderful beauty through the creation. Enjoy the picture, and most of all enjoy the Lord Jesus as creator and upholder. For indeed He is all that and much, much more.